Beloved GameCube hit would look sweet in 3D. A few days ago, I came to the shocking realization that I no longer owned a copy of Super Mario Sunshine, the plumber's 2002 GameCube adventure. For some reason, this sent me into a panic and to GameStop, where I was able to purchase a used copy for $14.99. Problem solved. 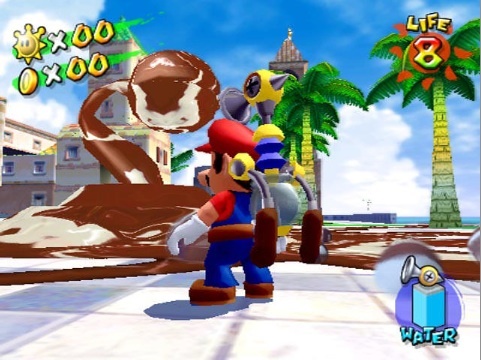 With the game in my possession, I spent a good portion of the weekend re-exploring Isle Delfino collecting Shine Sprites and cleaning that mysterious goop with FLUDD (AKA Flash Liquidizing Ultra Dousing Device). The verdict? Money well spent. It's no surprise that Sunshine's still enjoyable almost ten years later, largely because happiness oozes from every digital pore. The cheerful Piantas, the tropical setting and catchy tunes combine to form one huge party. Fitting, since Mario's on vacation. That said, the game does have some minor issues, starting with the camera, which can be a real nuisance. Getting a 360 view of a level is a challenge, but not nearly as tough as judging distances between jumps and where to land on moving objects. The biggest complaint, though, involves FLUDD. The backpack's voice gets on my nerves. Keep in mind that none of this ruins Sunshine in any way. I'm just nitpicking. If anything, I'd be on the couch playing right now. 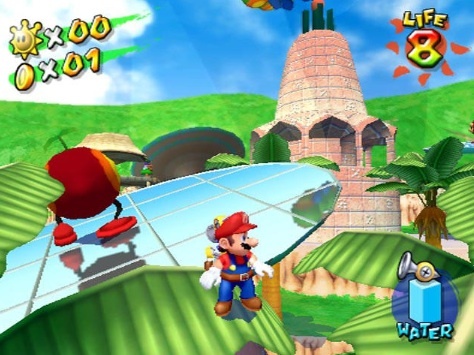 With this in mind, Super Mario Sunshine just seems like a great fit for Nintendo's 3DS. Granted, Super Mario 3D Land debuts this November, so there's no need for the GameCube classic at the moment. But Nintendo can't produce a new Mario every year, which means the gaming world needs something to occupy itself between adventures. Quite frankly, Sunshine's the perfect candidate. On the GameCube, controlling FLUDD takes a little while to get the hang of. With 3DS, it could be a breeze, as users put Mario into position with the circle pad, press the left trigger to start the flow of water and direct the stream via the system's touch screen, dragging the stylus in multiple directions. The stylus would also come in handy for using the camera, offering a more user friendly experience than the console controller's yellow analog nub. The only real question is whether the 3DS can handle a GameCube title. All I've seen are Nintendo 64 ports of The Legend of Zelda: Ocarina of Time and Star Fox 64. Not sure if the portable has the power to run Sunshine. If it does, what a wonderful game to have in the machine's library. Having 240 blue coins and 120 Shine Sprites to collect means hours of value, and I can only imagine what Isle Delfino would look like in glasses free 3D. For now, a 3DS version of Super Mario Sunshine is just a dream, hopefully one the publisher turns into a reality in the near future.